Cheeeeeesecake. It’s a beautiful thing. Cheese, in general, is my favorite food. Being able to eat it for dessert makes me happy. I’ve partnered up with PHILADELPHIA Cream Cheese for their Bring Out The Silver campaign. (Get it? The little bricks of cream cheese are wrapped in silver?) I’m bringing out the silver in the form of this scrumptious cheesecake. 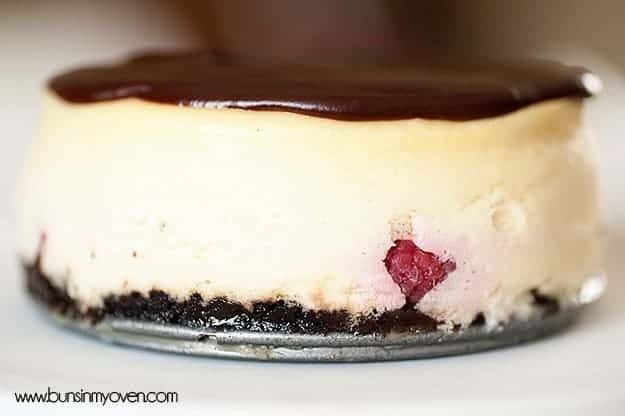 Raspberries and chocolate is one of my favorite flavor combos and when you combine it with cheesecake? Oh my, yes. Good things happen. Good things, indeed. Did you know that PHILADELPHIA Cream Cheese has been around since 1872 using real milk and cream? There are some products that I don’t really care about the brand. Cream cheese? Not one of those products. I always bring the silver, man. Why? They use fresh milk that is local to their processing facility. Their cheese goes from farm to fridge in just six days. The brick varieties of cream cheese have zero preservatives. Yes, zero. And, of course, I love that they use real ingredients. I hate when my food isn’t actually food, y’all. I know a lot of people have issues with their cheesecakes cracking, but I’ve got a few tips for you. First up, you want to bring everything to room temperature. This includes both the cheese and the eggs! It really makes a difference! You also don’t want to overmix your batter. My favorite tip, though, is to bake your cake in a water bath. I have never had a cheesecake crack when it’s been baked in a water bath. Some other fabulous bloggers are sharing mini cheesecakes today, too! Stop by and give them some lovin’! Bringing your ingredients to room temperature helps your cheesecake stay smooth. But don't worry, you can cover it with ganache anyway. Crush the OREO cookies into fine crumbs using a blender, food processor, or heavy mallet. Combine in a small bowl with the melted butter, stirring to coat the crumbs. Press the crust evenly into each prepared pan using your fingers or the back of a spoon. Set aside. 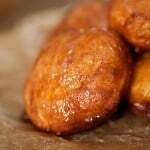 To prepare the filling, beat the cream cheese and sugar in the bowl of a stand mixer until light and fluffy, about 3 minutes. Add in the milk and mix to combine. Add the eggs, one at a time, until just incorporated. Stir in the sour cream, vanilla, and flour. Sprinkle the raspberries evenly in each pan over the cookie crusts. Cover with the cheesecake mixture, leaving a 1/2 inch of space for the cakes to rise in the oven. Place each pan on a rimmed cookie sheet. Pour 1/2 inch of water into the pan. This will help prevent the cakes from cracking. Bake for 40 minutes. Turn the oven off, crack the door, and let cool in the oven for 1 hour. Remove from the oven to cool on the counter for 2 hours before placing in the fridge to cool completely. When cheesecakes have cooled completely, prepare the ganache. Melt the chocolate and cream together in a double boiler, whisking until it comes together. 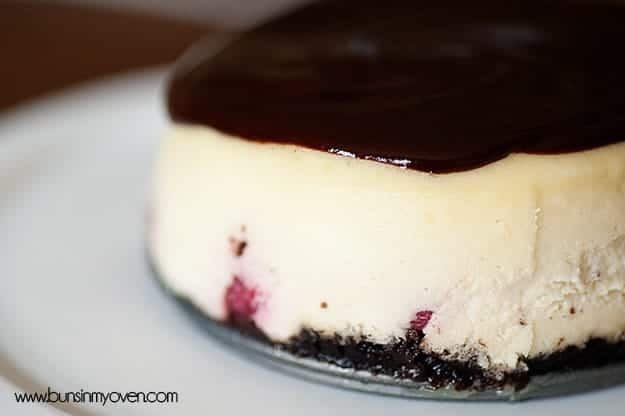 Top each cheesecake with the ganache. This is so cute! I want this right now! 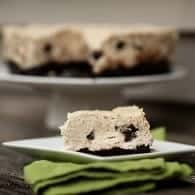 I love your cheesecake tips and how to make the perfect cheesecake – and this looks pretty dang perfect! Would it be a horrible idea to have this for breakfast? I’d like that- it looks to die for! Cheesecake and pumpkin pie are my two favorite desserts to eat for breakfast! 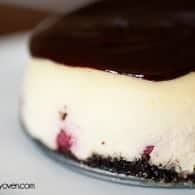 I’m always so puzzled when people say they don’t like cheesecake (like my brother)….because I am CRAZY about cheesecake! So rich and delicious. Love the chocolate ganache on here too. 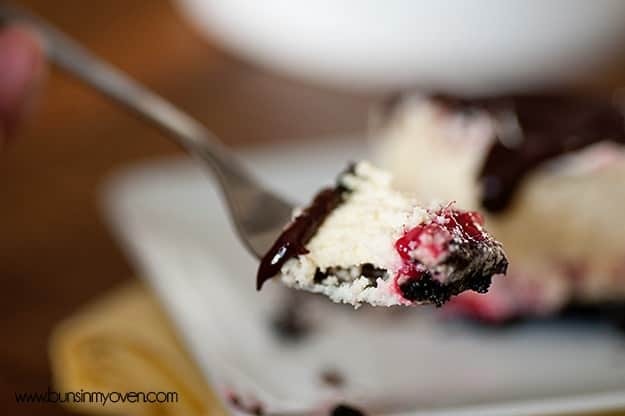 I love mini cheesecakes – that way I don’t cut too big a piece : ) Although let’s be honest… sometimes I’ll just eat more than one mini cheesecake. Chocolate and raspberries are a great combination! WHAT? I didn’t know they’ve been around that long. I love that!!! I know! I hadn’t realized it either. Pretty neat! I am in loooove! I made cheesecake cupcakes this past Christmas…I still ate 2-3 in one sitting. Perhaps I should upgrade to the mini 4″ buggers so I can justify only eating one (half) piece. Pssh. You can totally eat a whole 4 inch piece. Totally. I love cream cheese, and cheesecake even more. This is gorgeous Karly! YES please, I will take (Uhm eat) some now! Thank you! I’m drooling all over my keyboard! LOVE cheesecake and this sounds divine. I agree about using only Philadelphia Brand ~ the finest ingredients and never a failure when using it. Oh girl. This is actually one of my favorite flavor combos. Like… don’t tell anyone, but I like it better than chocolate and peanut butter! What about baking in a 9 or 10 inch for one beautiful fancy dessert for Easter dinner? Any baking suggestions on time and temp? Cheesecake has been absent in my life for far too long! 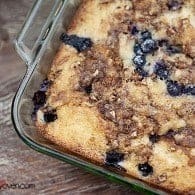 It’s making a comeback with this gorgeous dessert! The ganache alone is so tempting! So..because these are mini, I can eat twelve of them right? Oh I sure hope so. I could live on cheesecake and this is gorgeous! raspberries, do you think I could do this in a standard size pie dish.? Failure to follow instructions! I am baking the cheesecake in the 10″ springform pan as we speak. I was cleaning up when after 15 minutes I realized my raspberries are still sitting on the counter. So I sprinkled them on top, fingers crossed they sink. I tasted the filling from the spatula, WOW this is going to be hard to save for tomorrow. One note, I measured out the flour but didn’t read where to add it. So I added it with the vanilla and sour cream. Oh, I bet they’ll sink just fine! I just updated the recipe, but you were right to mix in the flour with the sour cream and vanilla! Cheesecake is my number one dessert and yours looks stunning Karly! LOVE it! Wish i had some right in front of me and dig in. Making one big cheesecake came out fantastic. 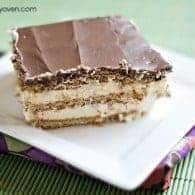 I saved the recipe because I will make it again and again. Thank you for the creative recipe. Two thumbs up! Amazing looking cheesecake! The raspberries look like a great surprise, and the tartness can cut off some heavy cheesecake. Definitely on my must try list. Thanks for sharing. I totally want a mega mini all to myself. Yes please. 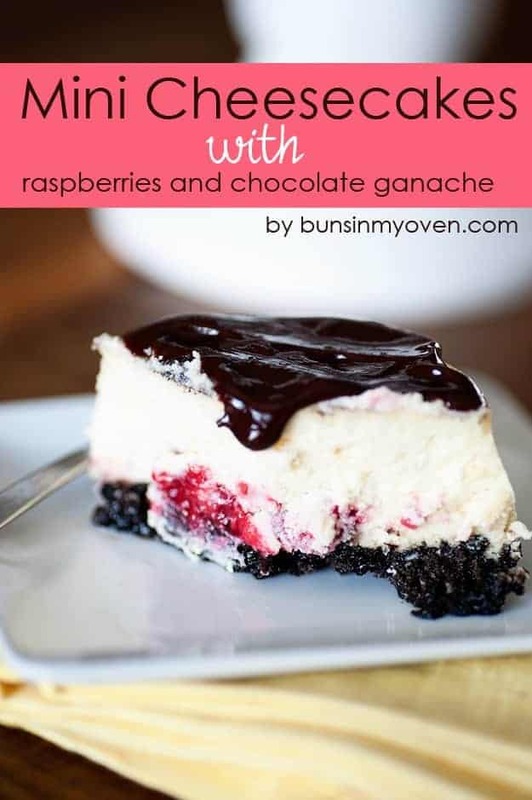 The combination of cheesecake, chocolate, and raspberries makes my mouth water. This is definitely an “Oh, yum!” recipe. oh my god Karly. For these, I love you even more. I LOVE raspberries and chocolate together! 🙂 AND CHEESECAKE! I want to take a big old bite out of that delicious cheesecake! Love the Oreo crust too! Oh man…chocolate and raspberries! Heaven my friend! ooooh this looks heavenly!!! I just discovered your blog and I love it!! Amazing work Karly! Hi, I was wondering if the Oreos are cream filled or plain ? ?